Most of the items in this FAQ apply to any Microsoft document library including OneDrive for Business, O365 Group, Microsoft Team and SharePoint Online document libraries. Are you new to using your CSCU OneDrive for Business library and want to know more information about sharing and syncing first? Check out the following frequently asked questions. We highly encourage you to read the information below before you share or sync for the first time. CSCU refers to all 4 Universities (CSUs), all 12 Community Colleges(CCCs), Charter Oak State College (COSC) and System Office (SO). What are my data recovery options? What do I need to know when working with Microsoft document libraries (OneDrive for Business, O365 Group, Microsoft Team or SharePoint Online)? How do I use my OneDrive for Business library? Why is the Microsoft OneDrive sync client asking me for my password? How do I use Microsoft OneDrive on other devices (Macs, smartphone/tablets)? What do I need to know about sharing? Help! My file is showing as locked but it isn't! What do I need to know about co-authoring documents with others? Can I be alerted when an item is modified? What do I need to know about syncing? How do I sync Office365 Group, Microsoft Team or SharePoint Online document libraries to my workstation? How do I fix sync issues? What is Files On-Demand and how do I use it? OneDrive includes tools that will allow you to recover your data. You can use the Recycle Bin, restore previous versions of a file or even roll back OneDrive to an earlier time/date. We have documented the process for you that describes each of these options and how to use them to recover your OneDrive Data. OneDrive for Business is different than a personal OneDrive. Microsoft provides additional information on the difference between OneDrive for Business and OneDrive. The Microsoft OneDrive sync client is the software used to sync Microsoft document libraries to your workstation from any of the following: OneDrive for Business, O365 Group, Microsoft Team or SharePoint Online document library. CSCU Faculty/Staff/Students will use their CSCU college or university provided Office365 accounts to login to Offie365 (or when accessing a document shared with them) and not a personal Microsoft Account. CCC Faculty/Staff and Students can refer to the Online Help Desk for support of their Office365 accounts. 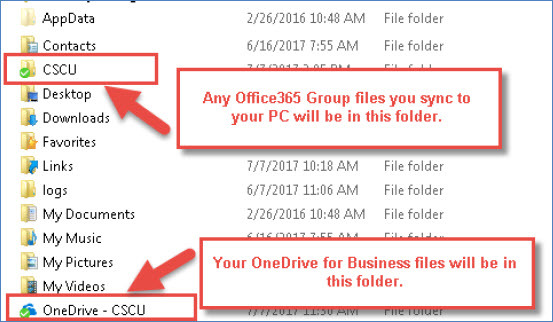 Faculty/Staff usage needs to comply with the OneDrive for Business Standard including not storing DCL3 data in any CSCU Microsoft document library (their OneDrive for Business, O365 Group, Microsoft Team or SharePoint Online document library). DCL3 data accessed by unauthorized entities could cause personal or institutional financial loss or constitute a violation of a statute, act or law. Do not store personal files in your CSCU OneDrive for Business library. It is meant for work related documents. When you leave CSCU, your OneDrive for Business library will be inaccessible and you will not have access to those documents. If you want to recover items after they have been deleted, refer to the FAQ item, "What are my data recover options?" for your recovery options. Note that you can also be alerted when a file is deleted by following these instructions to setup an alert. Microsoft's document libraries (OneDrive for Business, SharePoint Online, O365 Groups or Microsoft Teams) have two different views: regular and classic. Each accomplishes the same thing - access to your library folders/files - but they look and feel very different. If you are in the regular view, click on the "Return to classic <product name>" in the lower left corner of the browser window to use the classic view. If you are in the classic view and want to return to the regular view, click the Apps selector (in upper left corner of window) and select the appropriate tile from the App selection. Currently the Microsoft OneDrive sync client "View online" currently opens using the classic view. Use the information above to change your view if you prefer. If you want to maintain a file's Last Modified date, use the Microsoft OneDrive sync client and add files/folders using your workstation's file browser. If you use the Upload feature when in your document library, the Last Modified date becomes the date you uploaded the file. Previous versions of files are kept and can be restored using OneDrive for Business's Version History feature, refer to the FAQ item, "What are my data recover options?" for more infromation. Checkout and Checkin features are supported when accessing an O365 Group's Sharepoint site. You currently will not see checkout and checkin features from OneDrive and will have to go to it's SharePoint site (when in OneDrive you'll see in upper right corner "Go to site"). User's OneDrive for Business libraries do not support the checkout/checkin feature because they do not have a SharePoint site. Topics covered include: How to attach or share a document when using Outlook, accessing your library from a browser, using the Microsoft OneDrive sync client and Files On-Demand. NOTE: If you close the window and do not enter your password, the Microsoft OneDrive sync client will close and your files will not be syncing. You will need to launch the Microsoft OneDrive sync client from the Start Menu and enter your password. How do I use Microsoft OneDrive on other devices (Mac, smart phones, tablets)? When someone has Edit capabilities, they also have the ability to delete that file. If you are the owner of the OneDrive for Business library or O365 Group, unless you enabled alerts, you are not notified that it was deleted (although it will be placed in the recycle bin) and will be permanently deleted after 93 days if left in the recycle bin. You cannot at this time share a document with someone only to edit the document, it automatically gives them the permission to also delete the document. Therefore, we highly recommend that you enable alerts or regularly check your Recycle bin for files that others (who were given Edit permissions) may have deleted not knowing they were deleting the original shared document, not a copy of it. A person with Edit capabilities does not have the ability to rename or to share with anyone else. Are you co-authoring documents? Check out this Microsoft document on co-authoring. There are two groups of users you will can share files/folders with: Those who have a CSCU Faculty/Staff/Students account and those that do not. 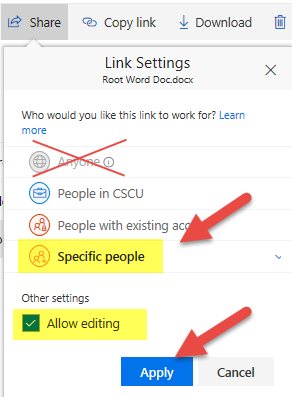 If the person you are sharing with is a CSCU Faculty/Staff/Student, when you share the document, use that person's college or university provided Office365 account. 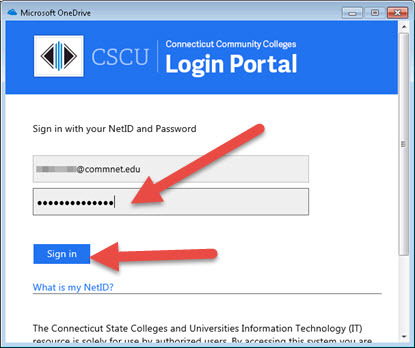 When the user clicks "Open" to access the document, based on how their account is defined in O365 and if they are already logged in or not, they will either access the document immediately, be prompted to login using their CSCU Faculty/Staff or Student account or be instructed that they were sent a separate email with a code. If they are sent a code, they need to enter it in order to access the document. If you shared a document with someone and they logged on with a different account to access your document. To fix: They can request access to use the other account and enter a message back to you. You will receive an email with their request that you can approve or deny. The very first time an External Guest accesses any file on our site, after they have logged in with their personal Microsoft Account, they will get this warning until their External Guest account is created on our site. They may have to wait a period of time (could be as short as a few minutes), but they can just click the link again and they will have access. This situation is confusing as they get the "Sorry, you don't have access to this page" but do have access and just need to wait and try again later. If you have removed access to the document or someone is attempting access that does not have access to the document. Expect some delay when working in OneDrive for Business. 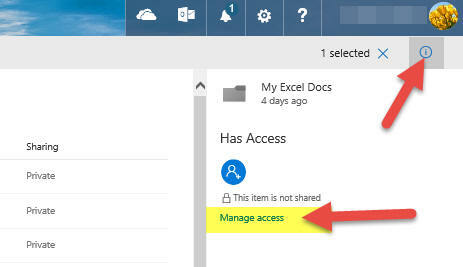 For example: if a file is deleted from your OneDrive for Business account. It is not immediately deleted and may exist for a bit of time in a synced location (i.e. your PC) and could also be accessible to someone that you shared it to. When someone shares files/folders with you, we suggest you keep the emails containing the links to the shared content handy or even bookmark the links to the as there does not seem to be an easy way to see all documents that anyone has shared with you. If those emails are lost, the person who sent you the shared invitation can resend a link. Be aware that if a user's account is deleted that had made changes to one of your documents, that their actions in the Version History of a file will no longer be listed once the account has been removed (i.e. Their name will no longer be listed in the Version History that they made any changes). This happens when a file is edited, or most often created, using Office Online instead of the desktop applications (Word, Excel, etc) and from what we've heard, there is so far no easy fix except to wait (typically about 30 minutes). There isn't a real lock on the file either, it just thinks there is - so there is no way to "unlock" the file, you just need to wait for it to realize there isn't a lock and it will clear. Everything has been attempted to manually make it aware there isn't a lock on the file, including logging off, clearing cache, closing windows, checking in/out, etc. Nothing has worked so far. When a solution is posted, we will show it here. In the meantime, to avoid this situation, use your workstation Office products to open documents from a document library. Even if you open the document from the O365 portal, you can still choose to use the desktop version of your Office product. You can co-author documents in both Office Online and in Office products installed on your workstation. NOTE: You must be using at least version 2016 to co-author documents and co-authoring is only supported in apps that support co-authoring (Word, PowerPoint, Excel) and only with modern file formats (.docx, .pptx and .xlsx). You can co-author documents in a OneDrive for Business library (including O365 Groups) or a SharePoint document library. Make sure you read our FAQ items on what you need to know about sharing and setting up alerts for when items are modified. We highly suggest using Word's Track Changes feature when co-authoring documents as we are aware that when OneDrive for Business saves versions of the document to the file's Version History that all changes made during co-authoring are saved as one version. Microsoft has a video that shows you how this works. follow these instructions to setup an alert for your CSCU OneDrive for Business library. follow these instructions to setup an alert for SharePoint Online document libraries, O365 Group or Team sites. When you select your sync location, make sure it is a local hard drive and not an external hard drive or USB storage. We are aware that issues preventing files syncing have occurred when the sync location is not a local hard drive. 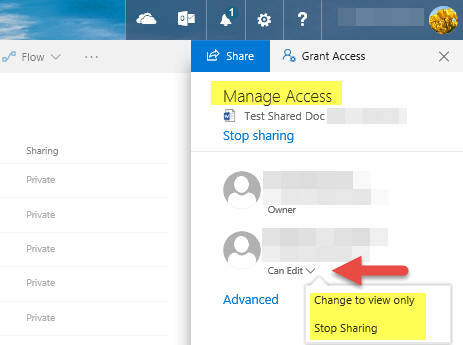 If you have folders shared with you and you want to sync the shared folders to your workstation using the OneDrive sync client, you will need to go to the shared folder and then you can click 'Sync' to sync the location to your local workstation. NOTE: Only shared folders can be synced, not shared files. Errors may occur when you try to sync files or folders to your workstation. You will need to locate and resolve any sync errors. Use the Microsoft OneDrive sync client (in systray) to see any sync errors and refer to the following FAQ item to attempt to resolve your sync errors. To see what files are syncing to your Windows PC, use the Microsoft OneDrive sync client (in the systray), right-click and click on 'Settings'. This will show you what locations you are syncing and you can change the locations and folders that are syncing, stop syncing or unlink the PC. You can also manage your OneDrive for Business storage from the Microsoft OneDrive sync client (in the systray) by right-clicking and click on 'Manage Storage'. After you have changed your NetID password, the Microsoft OneDrive sync client will eventually need your new password to continue to sync your files, if you do not enter your new password, it will stop syncing your files until you provide your new password. See the FAQ item for more information. If you used the Microsoft sync client prior to July 14th, 2017, your workstation's sync folder may still be using the old name 'Board of Regents System Office' vs. the new name 'CSCU'. Following this procedure will properly rename it to 'CSCU'. NEW: If you are running Windows 10 Fall Creators Update or later, you will now be able to control how your OneDrive for Business files are synced to your workstation. Files On-Demand allows you to access your files in your OneDrive for Business library without having to download them and use storage space on your workstation. All files, even files not downloaded to your workstation, will be listed in the File Explorer. Have a file you always want to store on your workstation? Easy! Set it to 'Always keep on this device' Check out this FAQ item for more information on Files On-Demand. If you notice that you are no longer syncing files from your workstation (the blue cloud icon is not showing in your systray), the Microsoft OneDrive sync client may need your password, refer to this FAQ item for more information. File path length (make sure the file path is shorter than 255 characters). NOTE: Users have reported that they have received various errors such as "We couldn't register this document" or "You won't be able to create links from other documents to this one." when opening or saving files if the file path exceeds the limit. The File is open in an application. Close any application where the file is currently being used and then the file should sync. Refer to this for a more detailed list of sync issues to check. Refer to this for some suggested fixes or workarounds for recent issues. If you are running Windows 10 Fall Creators Update (version 16299.15) or later, you will now be able to control how your OneDrive for Business files are synced to your workstation. Files On-Demand allows you to access your files in your OneDrive for Business library without having to download them and use storage space on your workstation. All files, even files not downloaded to your workstation, will be listed in the File Explorer. Have a file you always want to store on your workstation? Easy! Set it to 'Always keep on this device'. Here's how to enable Files On-Demand: If your workstation has Windows 10 Fall Creators Edition or later and the latest Microsoft OneDrive sync client installed, Microsoft OneDrive sync client will have a setting for controlling Files On-Demand. Right-click the Microsoft OneDrive sync client icon (in the systray) and click Settings. Then on the settings tab, you'll see an option to 'Save space and download files as you use them'. When this is checked, Files On-Demand is enabled. 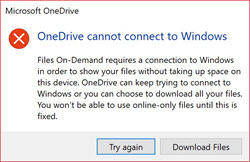 This is because the sync location being used is not the local hard drive and instead is using either an external USB or hard drive which cannot be used for the OneDrive sync location. You will need to go to OneDrive sync client settings tab (from the sys tray), on the Account tab unlink the PC from the account and then add the account again but this time select the local hard drive as the sync location. Learn more about Files On-Demand by referring to this Microsoft document.